There will be a strong collaboration in the coming months between the Committees, where mutual learning and experience exchange take place, and the Bureau Task Forces, where the findings from the Committees will be used to develop policy messages. For example, the three AER committees and the AER Task Force on Migration will work closely together to develop messaging ahead of the International Migrants Day: Promoting Diversity in Regions event in Barcelona on Tuesday 18 December. The Task Force on Cohesion Policy, which is currently under the responsibility of the Committee for Economy and Regional Development, will be transferred to the Bureau. The regions of Umbria (IT), Maramures (RO) and Brussels Capital (BE) discussed support for social entrepreneurs and the impact of such on improving regional and national policy frameworks. A discussion on the potential creation of an exchange programme for entrepreneurs from different regions took place. Interested regions should contact the Policy and Knowledge Transfer Coordinator. Talks progressed on the new Civil Servant Exchange Programme. It will be co-organised with the European College of Cluny and will provide high quality training and education as well as placements in regional administrations. Please fill out this survey if your region would like to participate in the programme. Emax Sweden presented their concept of a Youth Innovation Camp which could be deployed elsewhere in Europe. A workshop on the development of such a Youth Innovation Camp will be held during the Spring 2019 Plenary in Orebro (SE). Please contact the Programmes Coordinator for further information. A handbook on the use of SDGs as a policy framework could be developed. Interested regions should contact the Policy and Knowledge Transfer Coordinator. A webinar will be organised in January 2019 to further help regions make use of the TAIEX EIR programme for peer learning in the field of environmental policies. Please contact the Project Unit for further information. The plenary was officially opened on Tuesday 25 September with a video message from Ana Brnabić, Prime Minister of Serbia. In it she stressed the importance of regional cooperation as a means to promote integration. She also reiterated her support for the European Union, saying that it is the ‘first and foremost priority’ for Serbia. The opening ceremony was followed by the joint plenary. At this we were very pleased to recognise the outstanding contributions of three AER regions: Umbria, Vienna and Scotland. All three were rewarded a ShineBright Recognition Award for their commitment to the AER core priorities. We were also very pleased to hear from the latest AER and Eurodyssey member, the region of Sardinia, Italy. Massimo Temussi, Managing Director fo the Sardinia Employment Agency ASPAL, provided an overview of active labour policies in the region. The AER Project had the opportunity to provide and overview of their work with this video. Finally, we gave a warm send-off to Agneta Granström, County Council Commissioner, Norrbotten County Council, Sweden, who will be leaving politics. She has been an active and engaged member of the AER for several years. The discussion focused on how public institutions collect and generate enormous quantities of data in areas as varied as unemployment, air pollution, hospital consultations etc and how this data can best be re-used to create or improve both public and private services. There is a need to change the political perception of Open Data and instead view it as opportunity for policy-making. All three outlined achievements made over the last six months, including regional projects which have recently gained funding to work on integrated care systems, social entrepreneurship and social inclusion. Jean Luc Vanraes, president of the Committee on Economy and Regional Development initiated a discussion on the Sharing Economy and the role it can play in the regions. While many AER regions are very familiar with collaborative services such as Uber, Airbnb and Deliveroo, the sharing economy landscape is very diverse and includes companies, which are very social and very green as well as classic larger corporations. The stakes are furthermore very different for larger cities or for rural areas, where collaborative services can compensate gaps public services. Bruxelles Capitale region will organise a conference on this very topic on 4 December in Brussels. Further information will follow on this in the coming weeks but we do hope you can join us. At the plenary for the Committee on Economy and Regional Development members decided that the Task Force on Cohesion Policy, which for historic reasons was under the responsibility of this Committee, should be transferred to the Bureau for coherence purposes, as it is the Bureau which is in charge of the identification of policy messages and advocacy activities. At the plenary for the Committee on Social Policy and Public Health members said farewell to Agneta Granström, Vice President of the Committee and Chair of the AER e-Health network. Albert Castellanos, Catalonia (ES) was elected Vice-President for Health Innovation, other positions were left open for future candidacies. At the plenary for the Committee on Culture, Education and Youth a discussion took place on the launch of the Civil Servant Exchange Programme, an initiative proposed by Radimir Čačić, President of this Committee. This programme will be hosted at the European College of Cluny, in the region of Bourgogne, France and is expected to be operational by 2020. If your region is interested please fill out this survey. Two workshops took place in the afternoon. The AER Working Group on Energy and Climate Change looked at use of the Sustainable Development Goals as a policy framework. Many regions are very active in this space. Oppland, Norway and Varmland, Sweden provided case studies. The AER Working Group on Transport and Mobility looked at Sustainable Urban Mobility, with Miroslav Tadic, UNDP Climate Change Portfolio Manager, providing the foundation for the discussion. The region of Östergötland, Sweden is particularly engaged in this field. Mathieu Mori explained the main advantages of an EGTC, especially for interregional projects on transports. Regions interested in developing an EGTC to develop project should get in touch with the EGTC platform of the Committee of the Regions for support. AER is involved in the New Mobility Services Initiative of the European Commission. This initiative was set up within the Sustainable Urban Mobility Action Cluster of the European Innovation Partnership on Smart Cities and Communities (EIP-SCC). The engagement in this partnership has proven very beneficial for Östergötland as it allows to source knowledge, innovation and qualified advice. Other regions are invited to take part in the New Mobility Services Initiative. On 10 October, a seminar on “Sustainable Urban Mobility in the Smart City: How to make change happen?” in Brussels will be an opportunity to learn more about this initiative and meet stakeholders. Interested members can register here. 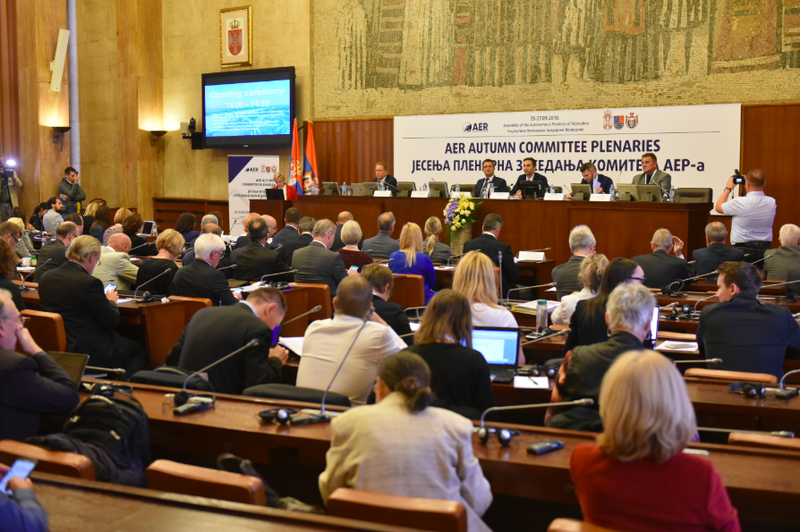 On the occasion of the AER Black Sea Summit, the AER partnership with the Arge Donau Working Community was reinstated. This will be of interest for members who would like to develop partnerships along specific transport corridors too. On Thursday 27 September a breakfast debate on ‘Welcoming unaccompanied migrant children’ was held with guest speaker Sarah Sommer, Senior Programme Manager at the European Programme for Integration and Migration, a collaborative fund supporting civil society projects in the fields of migration and integration. This topic was chosen by the President of the Committee on Social Policy & Public health Mihai Ritivoiu based on the discussions, which took place during the Spring plenaries in Arad. At the EPIM the focus is on youth on the move, rather than unaccompanied children only, in order to not leave out other vulnerable youth. The difficulty with youth on the move is not scale, as such, but the fact that good solutions still have to be developed. This can only happen through pilot projects, mutual learning between stakeholders and involving users in a feedback loop to evaluate the effectiveness of measures. Further collaboration with EPIM and partners will be developed to prepare the mutual learning event on migration to be held on 18 December in Catalonia, which will feed the work of the Bureau Task Force on Migration. it should be more expensive to behave badly than to do the right thing. The workshop finished with a presentation on the TAIEX EIR programme of the European Commission which finances study visits, workshops and expert visits to help regions improve environmental policies and learn from their peers abroad. Regions interested in using the programme can check the Commission webpage explaining the procedure to benefit from it here. A webinar will be organised on this topic in January 2019. The AER Group on Equal opportunities has regular phone meetings and met as well in Novi Sad to discuss the development of a Code of Conduct for AER. View photos HERE and HERE. View press conference videos HERE.